Fuerza Bruta shall be performed in a gigantic tent in the external area of Bourboun Shopping which occupied 2000m². Over hundred people are hardly working on this project. It needs 33 tons of equipments shipping from Uruguay and almost 20 days of assembly to build the whole thing up. This huge effort we´ve put is in order to make the show happens. 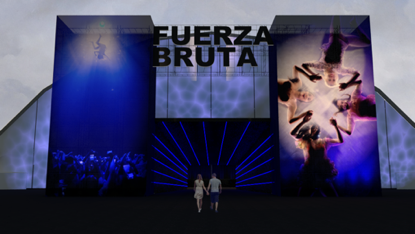 Fuerza Bruta is an 60mins event where worlds collide and reality takes a back seat. At show time, audiences are ushered onto the main stage where they are engulfed in a 360 degree spectacle featuring mind-blowing visual effects just inches above the audience that must be seen to be believed – a man running full throttle on a giant treadmill, bursting through a series of moving walls; performers suspended in mid-air surrounded by a vast sea of Mylar; and gorgeous women twisting ethereally in a Lucite pool above the audience.